click, trash: Trash 1 location. Take 1 bad publicity. "It's not personal. Urban renewal is a necessity of the modern world. It's always someone's home, yours is no different." Ah, Lizzie Mills. Is it okay if I call her Lizzie? Probably not, if I like the house I'm living in. 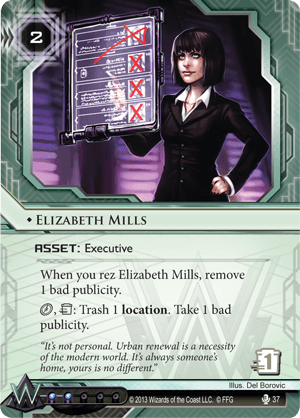 Anyway, Ms. Mills here does two things, in this order: she fixes a bad publicity; and she can give you that bad pub back if you decide that you'd rather destroy a location. Fixing bad publicity is pretty nice, and Ms. Mills does it for pretty cheap. It costs to install her, and 2 to rez her, and that removes one bad pub. Compare that to Witness Tampering, which costs 4 and 2 and removes two bad pub; she's half the cost for half the effect. But there are ways that you can get even more mileage out of Ms. Mills. First, notice that the bad pub is removed whenever she is rezzed. Do you know who likes rezzing things over and over? Blue Sun, that's who. With Blue Sun, you could potentially rez her at the end of the runner's turn, pick her up to gain 2, reinstall her for , and pay the 2 to rez her again. 2 bad publicity, wiped clean. Repeat as needed, or until the runner gets fed up and trashes her. She's also an executive...which means that, after you rez her, you can get a few extra bad pub off by Restoring Face. You monster. If the runner isn't playing any significant locations, then this about all the use that you can get from Ms. Mills. Even if they are playing a card like Order of Sol or New Angeles City Hall, you have to question if it's worth regaining that bad publicity just to get rid of it. What locations might be worth destroying? Well, if you can trash an Earthrise Hotel immediately after it gets installed, you've denied the runner 6 free draws, which is a pretty nice tradeoff for one bad publicity. If you can destroy a Personal Workshop with a few important rig components still on it, you've set the runner back a long way. If Noise is relying on selling his used Caches to Aesop for econ, that could stall him for a while while he digs to find a second copy. "Yes I'll be on the first flight out. Yes sir." "Yes this must be the place." "Alright boys, let 'er rip!" "Okay boys, same deal as last time, knock it down here, here and..."
"Wait stop this is the house of God please no"
"What is it now? I've got some college kids to evict." "Oh hey Frank. Hey D. What's up." "I'm doing great, thanks. Anyway, how would you and the gang like to participate in some incandescent structural alteration? "What do you mean, "what does that mean?" didn't you graduate from Armed Thugs University?" "Let me make this simple. It involves flamethrowers." "Okay great. How soon can I get you on a plane to India? 1 ? Awesome I'll grab you plane right away."